The Office@Hand Mobile App features Integrated Calling which makes it possible for an iOS device to manage calls without unlocking the screen and without losing an ongoing call or an incoming call. This feature can be enabled or disabled on the app’s settings. 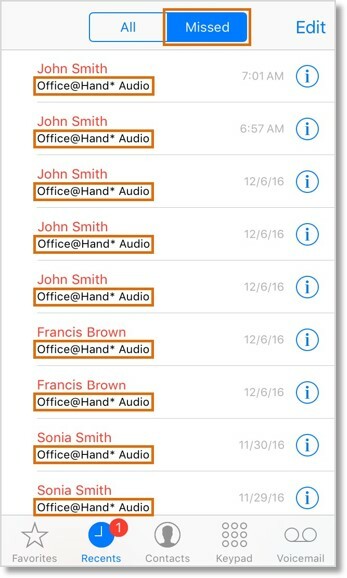 The Office@Hand Mobile App has incorporated CallKit — a capability provided by Apple which gives the Office@Hand app more control of the iOS device when in a call and allows the user to answer calls more easily when the device is locked. CallKit allows an ongoing Office@Hand call to remain active even if a second call comes to your mobile number while using the Office@Hand Mobile App. The Office@Hand Integrated Calling feature makes it possible for an iOS device user to manage multiple calls without unlocking the screen, and without losing an ongoing call or an incoming call. A user can simply manage the feature by either enabling or disabling the Integrated Calling feature on your Office@Hand Mobile App settings. With Integrated Calling, iOS device users are provided with a better call experience — an incoming screen appears, allowing them to interact with the call with 1-touch, either from a locked screen or when engaged in an active Office@Hand call. Answer calls from the locked screen just like a native call.• No more fumbling with the incoming call push notification. Users can choose to answer, reject, or send incoming calls to voicemail when in an active call. No more abrupt interruptions and calls put on hold undesirably. Note: See Mobile App – Integrated Calling – Sample Screens | AT&T Office@Hand for more information. The Office@Hand Integrated Calling feature makes it possible for iOS device users to have a more elegant experience when interacting with or handling an incoming call from a locked screen or when on an active call. Avoid call interruption — Office@Hand calls will not be interrupted by incoming mobile calls anymore. Remain connected to your Office@Hand call and choose to either answer, end, send the incoming call to voicemail, or send a pre-filled message to the caller. Answer Office@Hand (VoIP) calls without unlocking your phone screen. Control your Office@Hand call using Bluetooth devices. 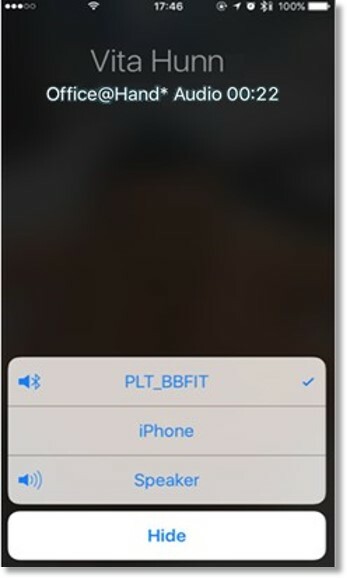 Office@Hand calls are displayed as “Office@Hand Audio” in the incoming call screen and in the native call log, whereas a personal call would only display a contact’s name or just a number. Office@Hand calls will be listed in the iOS device’s native call log when Integrated Calling is enabled. Missed calls are displayed in red, and users can return a missed call by tapping a number on the call log. Office@Hand calls are labeled as “Office@Hand Audio” underneath the caller ID. The users also have a set of standard features available to call or text a contact that is in the call log. Note: You may disable Integrated Calling, however, this setting would cause your Office@Hand calls to be interrupted by incoming mobile calls.